Did you know that you can actually burn the bottom right off of a stainless steel pot? Really! It’s pretty amazing! If you, too, would like to try this experiment at home, this article will tell you all you need to know. By the way, choose flattened chicken, it cooks faster, and no, I don’t mean one that has been hit by a car. Go to Wal-mart, you’ll find it. Once the chicken is in the oven, quick, dash back to your office and try to finish that letter before you start on the potatoes (we have to eat healthy, people!) Now, you’ve only got an hour to get dinner cooked, so be quick about it. When you’re finished drafting the letter – or after 5 minutes, whichever expires first – walk, no, run back to the kitchen and scrub the potatoes. Now, for pete’s sakes, get your apron on if you haven’t already done so. We don’t need any unnecessary trips to the laundry room in the midst of this operation. Stop! For heaven’s sakes, do not put the potatoes, or any other vegetable, on any surface touched by – or within a 1 meter radius of – the raw poultry. You risk cross-contamination and certain shame for the rest of your life. You need to immediately sterilize the entire area with the spray bottle of bleach that you stow conveniently under the counter for this very purpose. Put rubber gloves on while your at it. OK, place the just-scrubbed-and-chopped pototoes into a saucepan of water and turn the burner to high. Put a second saucepan of water on the stove, with a vegetable steamer insert, and turn burner to high as well. There should be just enough water in the bottom to peek out of the steamer insert. Do not overfill the pot with water. We do no want to drown the vegetables and risk having all their nutrients leach out into the steaming water because that would defeat the whole purpose. OK, got that? Two pots with water, two burners on high. 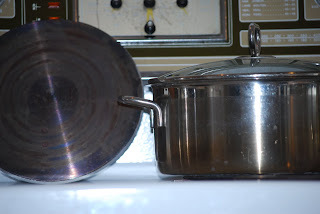 Yeah, that is the bottom of the pot on the left. I wish I was kidding. Lesson? Give up multi-tasking before you burn the whole house down.